Combustible Celluloid Review - Citizen Welles (2001), Orson Welles, etc., Orson Welles, Edgar G. Robinson, Orson Welles, Loretta Young, Anthony Perkins, Jeanne Moreau, Romy Schneider, Elsa Martinelli, Suzanne Flon, Akim Tamiroff, etc. With: Edgar G. Robinson, Orson Welles, Loretta Young, Anthony Perkins, Jeanne Moreau, Romy Schneider, Elsa Martinelli, Suzanne Flon, Akim Tamiroff, etc. Written by: Orson Welles, etc. Now that he's gone, everyone claims to recognize Welles' genius, yet he had trouble scraping together twenty bucks to make a film when he was alive. 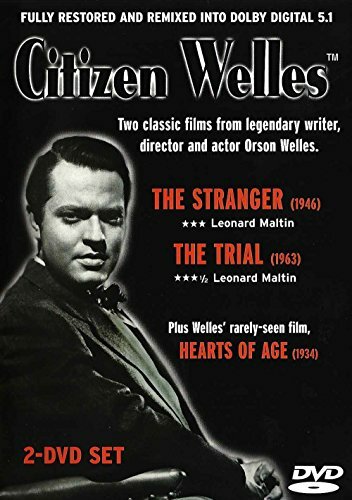 The new double-disc set, Citizen Welles (FOCUSfilm Entertainment), offers three disparate views of his amazing career. Welles made The Stranger (1946) as a last-ditch attempt to prove that he could deliver a profitable Hollywood film as well as anyone. So this thriller starring Edward G. Robinson as a post-WWII Nazi hunter and Welles as a Nazi spy hiding out in an American small town comes across as strangely... normal. Unfortunately, it still didn't make any money, as if the public could sense that Welles was pandering to them. Yet, it remains an interesting film, full of bizarre shots and fascinating little moments, like the general store guy who plays checkers all the time. Based on the novel by Franz Kafka, The Trial (1962) better represents Welles' true vision. Anthony Perkins stars as accused man Joseph K. in this nightmarish and funny film that plays astonishingly well with dream-logic, jumping from one paranoid scene to the next without any reason. Welles again stars in a supporting role as K's barrister, and Jeanne Moreau appears as K's neighbor. The disc also includes Welles' first attempt at filmmaking, the bizarre and amateurish short Hearts of Age (1934), made when he was 17. It's not very good, but it does contain themes that Welles would stick to for the rest of his career. This package sounds like a great deal -- and it is -- but purists will want to hold off. The two features were painstakingly restored, but from Public Domain elements instead of the original negatives or prints. As a result, the picture feels slightly muddy and the black and white contrast is rather dull. Still, they're quite a bit better than the horrible VHS copies I had in my library up until now. Bonehead critic Jeffrey Lyons (he chose The Majestic as the best picture of 2001) provides commentary tracks for both films, rehashing stories about hanging out with Welles, but offering little actual information. The package also includes still galleries, a "Making Of" documentary, and trailers.